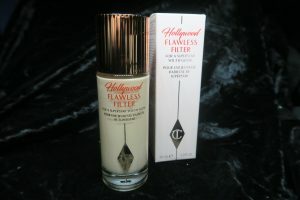 It probably comes as no surprise, but my first essential is the Charlotte Hollywood Flawless Filter*. But what exactly is it…primer, foundation, liquid highlighter?? I’ve tried so many products from all sorts of brands claiming to do the things this does, but this is like no other and I have nothing like it past or present in my (extensive) makeup collection! It’s such an interesting formula and one that delivers! Part primer, part illuminator…blurs and perfects too! I wouldn’t say it gives coverage, but definitely does something boarder line magical for your skin! A complexion booster is probably the most accurate way of describing the Hollywood Flawless Filter…the ultimate hybrid glow giver! ✖️ Available in 7 shades (there’s something for everyone as the formula’s so sheer). ✖️ 30ml/ doe foot applicator. ✖️ Free from – Parabens, fragrance, gluten, alcohol, nuts and Talc. ✖️ Multi use – use alone or with a touch of concealer to naturally perfect, under foundation to prime and boost radiance, mixed with your fave base products to sheer out and add glow, applied over foundation/ other base products as highlight (which doesn’t disturb the products beneath). ✖️ Inspired by digital filters – perfecting and high gloss glow giving. ✖️ Smoothing airbrush polymers to smooth and minimise pores and fine lines. See, I told you it does everything…and actually delivers on these things too! You can choose a slightly deeper tone to give your face a bit of colour/ warmth if you want but I use 1 Fair, the very lightest shade. Reason being, I’m super fair anyway so don’t want to alter the shade of my base products on the skin. I also always use some form of light bronzer/ contour/ blush etc anyway on makeup wearing days that give me all the colour I need! I love how it gives a non glittery, wet but not greasy look without looking obvious. You only need a really small amount to make a massive difference. Unlike a lot of people I hear not really being in to the doe foot applicator style bottle, I’m actually a fan! How is it any different to using a doe foot concealer you know?? (Obviously a different story with products in my kit, but for use on myself…I’ll go straight in with it!) I like to apply it after my skincare as primer for my base products/ whatever I’m wearing that day on to the high points (brow bone/ forehead, cheek bones, cupids bow etc) and then lightly boop (technical term there) it in to my skin using a damp beauty sponge (that I’ll then use for the rest of my base). I have combo skin and it looks so good on, it’d work for/ benefit most if not all and I’d urge you to even grab yourself a sample if possible…you won’t regret it! 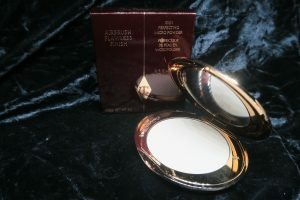 The Hollywood Flawless Filter* (and Charlotte Tilbury as a brand) is a bit spendy/ on the higher end price side of things, but this is one of those worth every penny products in my opinion and the need to use so little…I can see it lasting ages even if worn most days which I do! 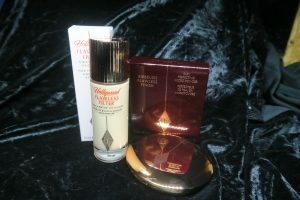 My second essential is the Charlotte Tilbury Airbrush Flawless Finish Pressed Powder*. This stuff’s award winning for a reason and in my opinion (and the opinions of many others!) well deserving of it’s now cult status! Gorgeous sleek rose gold packaging aside, this formula is everything! There are quite a few powders (loose and pressed) that I love and use regularly…this one, spendy as it is (again worth every penny) is in a league of it’s own. I’d use the same principle of not going OTT with powder on skin of any age, but more so as I’m getting older and especially ’cause I use this to set my under eye…this never looks heavy, cakey, overdone and instead just sets perfectly, leaves you looking smooth and naturally set! ✖️ Available in 3 shades (again something for everyone because of it’s sheer formula – I use 1 Fair). ✖️ Skin perfecting finishing powder. ✖️ Gluten and sulfate free. ✖️ Soft focus micro powders blur lines, pores and imperfections leaving your skin silky to the touch. ✖️ Light reflective for a luminous, even finish. There’s not a lot more I can say about this powder that I haven’t already, other than it’s perfection! Especially for setting under my eyes, but even to set the rest of my face I’ll always go in with a smaller brush than you think you need. Preferably something slightly tapered for precise application. You really don’t need a lot and even though I feel like it’d be a physical impossibility to apply too much, as well as being able to more easily just place it where you need…it’d save you from going through it too fast unnecessarily too. It’s a handbag, makeup bag and general life essential! The Airbrush Flawless Finish* is even part of my current (it would take some amazingly incredible alternatives to make me think any differently at the moment!) holy grail under eye product combo…Jouer Essential High Coverage Liquid Concealer*, set with this! I use it to set my under eye, whole face, over foundation…even just over concealer/ bare skin on minimal makeup days, it’s beautiful. Doesn’t cover (which I don’t really like anyway in a setting/ finishing powder) but perfects like no other! These posts’ll pop up as and when, but let me know if there’s a specific brand you want me to focus on or if there’re any particular products you’re intrigued about!